The actors of “Harry Potter” franchise reveal new latent sides of their talent. Earlier I wrote about tremendous plans of Daniel Radcliffe, Emma Watson, Rupert Grint and the writer J.K. Rowling. This post is dedicated to “a bad boy” Tom Felton who seem to surprise audience with his decision to become a rapper. The British actor already has some music experience as he released his debut album «Time well spent» in 2008 which included just five songs. However the first attempt of Tom Felton in music niche gained success among the actor’s fans. In order to promote his second album “All I need”, Tom was blogging on Youtube where he showed his music talent by means of amateur guitar playing. However these two works don’t include rap songs. The 23-year-old actor claims he has already signed a contract with an independent music label. 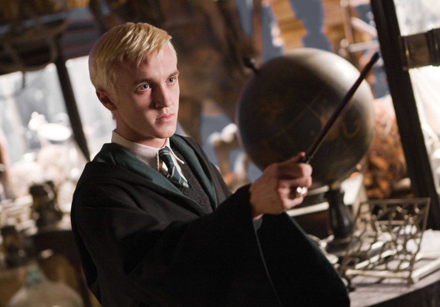 The Harry Potter star, Tom Felton turned out to be a fan of “N-Dubz” which served him as an inspirator. I was thinking of doing some N-Dubz-style stuff. I am looking to get into the grime rap UK scene. Maybe very soon we will see an incredible transformation of “Draco Malfoy” wearing rapper‘s stuff. Does it mean that Tom Felton finishes his acting career? Who knows! At least we can see him in a Hollywood blockbuster “Rise of the Planet of the Apes” this year.